Like a copy of our new Sample Bag Brochure? Just email us! SKC, the world leader in sampling technologies, produced its first sample bag in the late 1970s. The bag was made of Tedlar® film and soon became the classic sample bag for VOCs. Over the last 30 years, SKC Tedlar bags have been the number one choice of professionals. 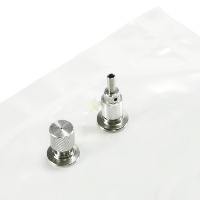 SKC sample bag fittings are not "off-the-shelf" industrial fittings, but are designed specifically for air sampling. The fittings, offered in a choice of materials, feature an efficient design that combines the hose/valve and septum fitting into one lightweight fitting. SKC manufactures its sample bags out of clean top-grade films including SamplePro FlexFilm, (SKC proprietary film), FlexFoil, FlexFoil PLUS, SKC SamplePro PVDF, and FluoroFilm (FEP). Seams are strong, evenly sealed, and leak tested. SKC offers the largest selection of bag materials and sizes. SKC maintains the lowest bag prices. If you require a sample bag that is not part of our standard range, why not request a no-obligation quotation for a custom bag? Available materials include Tedlar, FlexFilm, FlexFoil standard and PLUS, and Fluorofilm, with a choice of fittings.